I know the blog has been quite neglected for awhile, but there are changes coming with the Autumn winds…. The beginning of the year was quite tough with the passing of friends and family members. I took time and reevaluated much of my life. One thing that became clear was that I had to change elements of my work. I gave several months notice at my main job and will be focusing more on freelance and my stores come October. I promise more frequent posts! I have cut down on some of my “making stuff” the last few months to focus on building the vintage store, setting my studio/office up, and wrapping up the current job. I hope to be back on track soon with some larger creative projects. 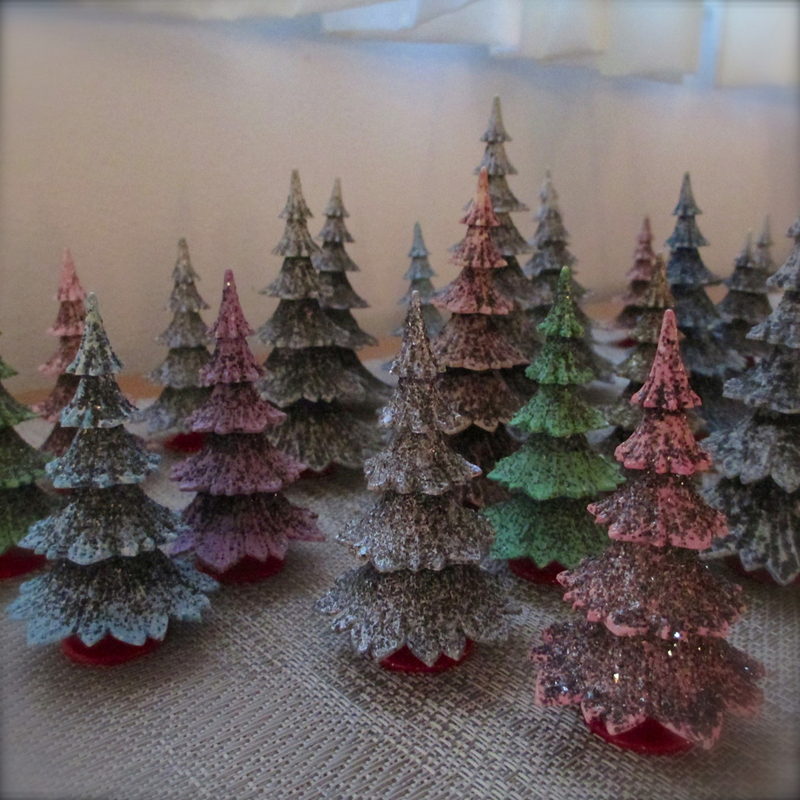 I am posting pictures of some of the smaller “wintery” and “surreal” craft projects I have been able to work on. A couple figures are on Etsy in “The Haunted Lamp” along with some patriotic items, bottle brush trees, and a few traditional ornaments. Fall preview presented by Edward and Mr. Duck. I am happy with the progress and with the support my vintage store, Haunted Lamp Vintage, is finding. I only sell things I love, collect, and use myself. It is reassuring to know there are others out there with my quirky tastes and eclectic interests. This Fall there are many new items that will be added to the store including more vintage millinery, buttons, and findings. I have collected (hoarded) many of these things for years and I think I now have enough to share. 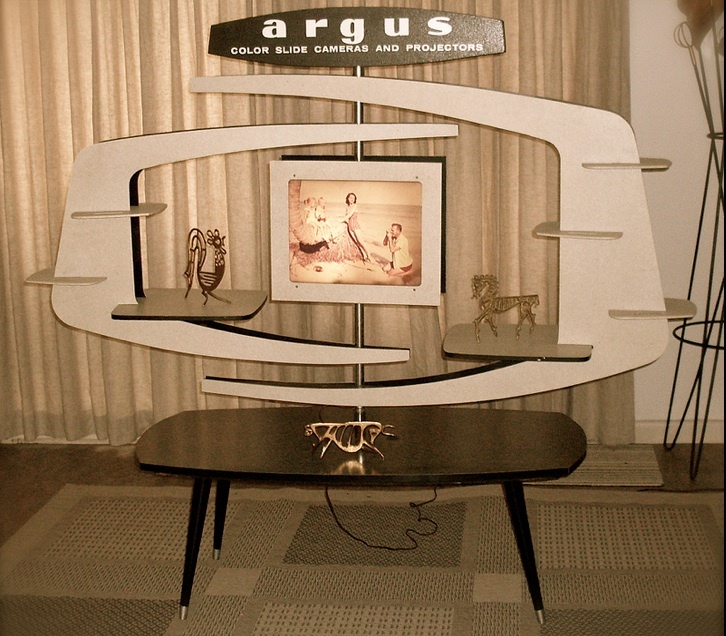 Expect to see some vintage home items as well because my closets and garage are overflowing….. 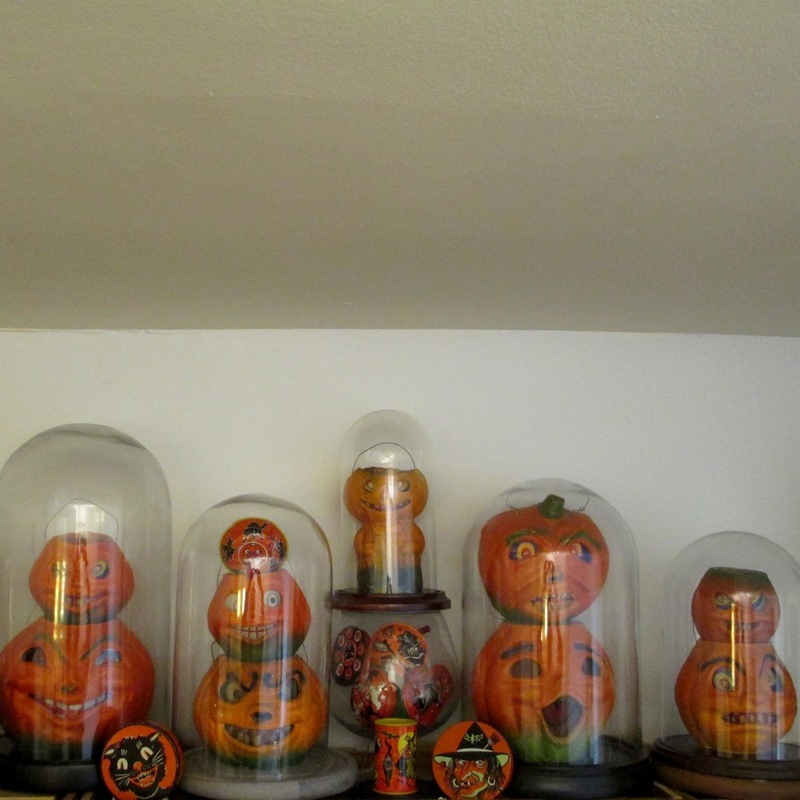 I didn’t know where to put these this year so this happened…..
German glass, Dresden animals, and beaded Czech ornaments. Bimini animals, blown glass “fantasy”, and tinsel/scrap ornaments in this mix. Mostly glass birds at the top and my very old lead-silvered ornaments. Icicles and lots of old tinsel ornaments at edges. The center has a pressed paper “Merry Christmas”. Naked wreath made of painted branches, faux pine sprigs and spidery greenery. The “Joy” vignette has made a comeback this year. One of the vintage Japanese deer frolicking on the giant letters. Another deer spied in the aluminum forest. 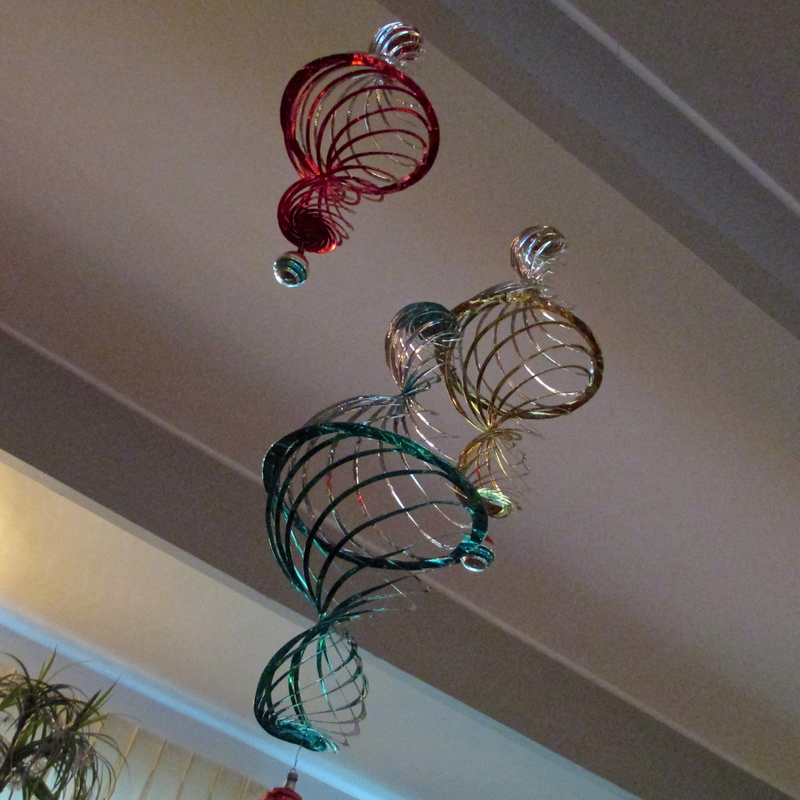 One of the many vintage Christmas mobiles around the house. 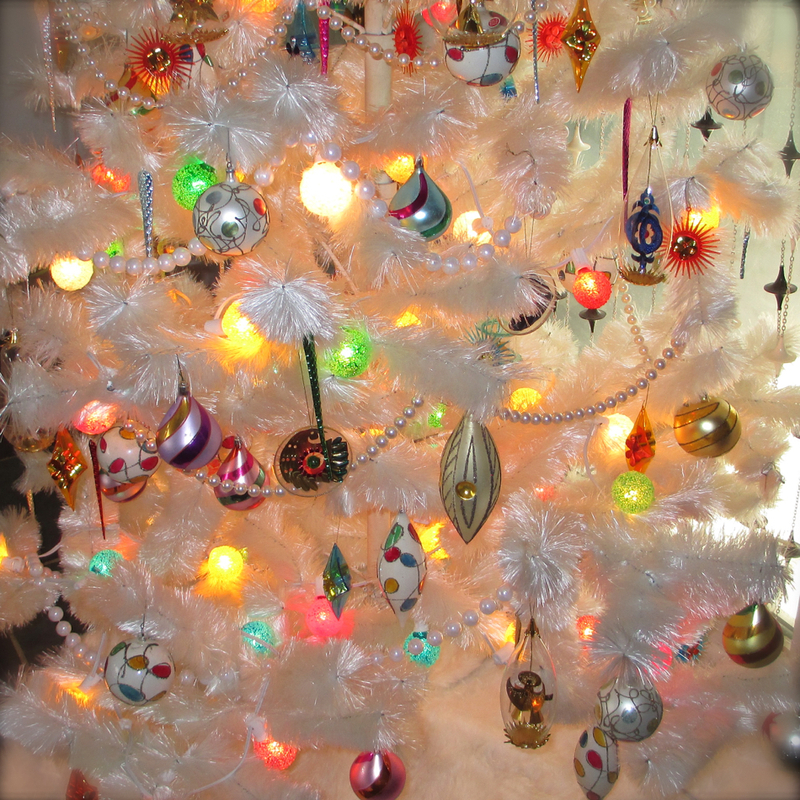 Vintage fiberglass tree with Resl lenz, mod plastic, Polish, and unsilvered ornaments. An old paper mache store Santa on a 50’s clock in hallway. A vintage Italian deer ond old bottlebrush tree. The “frosted” tree has become a tradition. 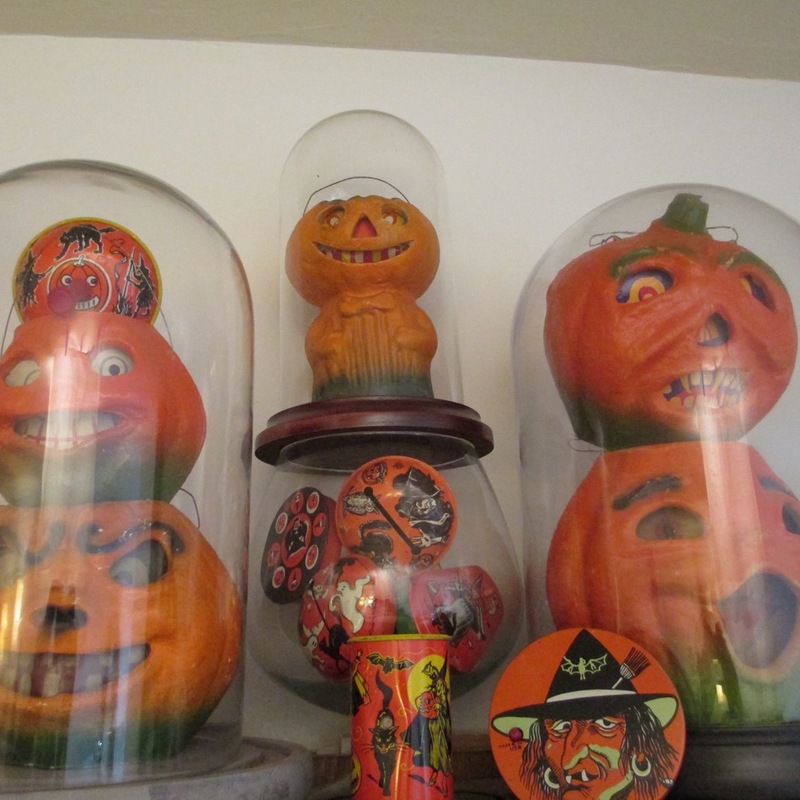 Christmas is definitely my big “decorating” holiday, but every year I seem to do more vintage Halloween! 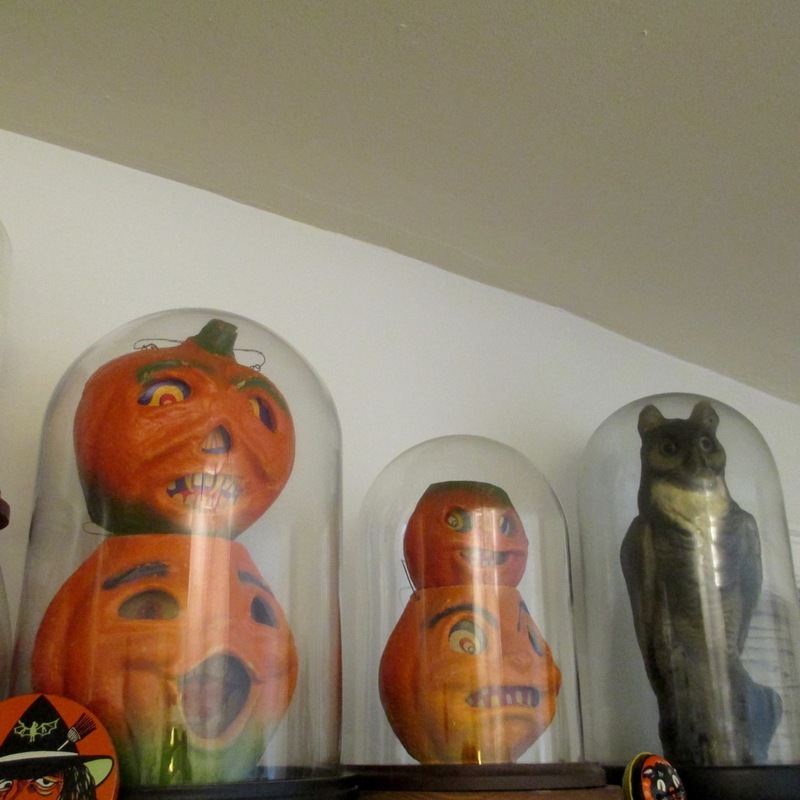 This year I put my paper mache lanterns and noisemakers in bell jars. If I had the space, I would keep them like this year round! 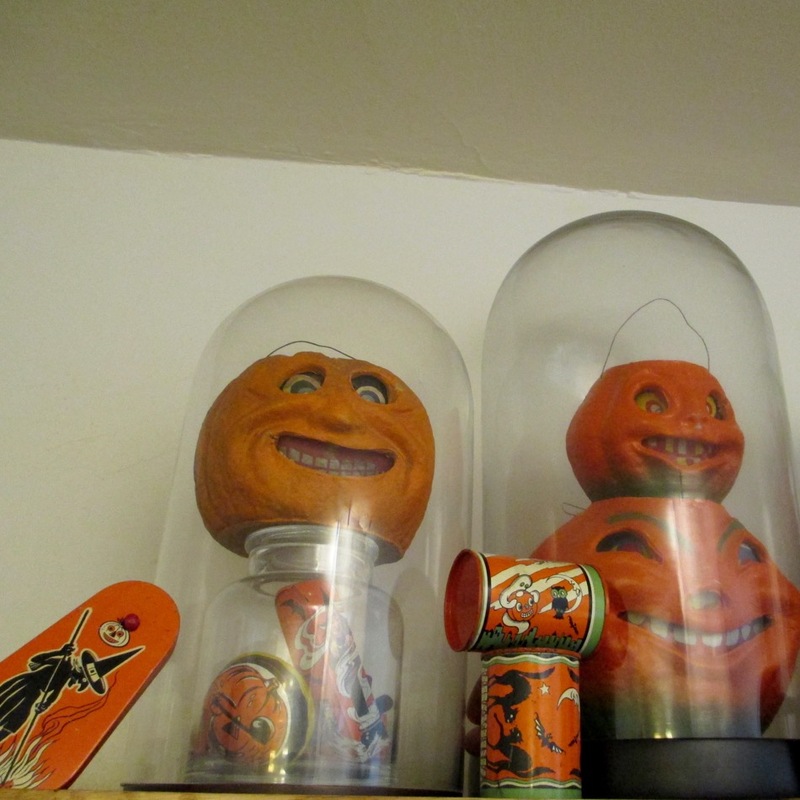 Categories: Uncategorized | Tags: 1930's, 1950's, bell jar, Halloween, Paper Mache, Pumpkin | Permalink. 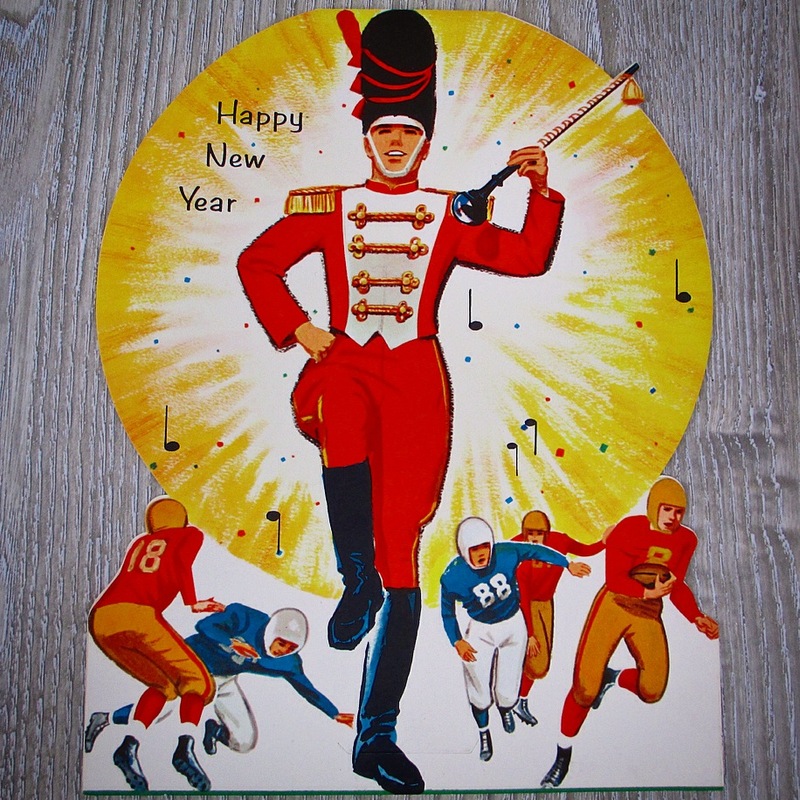 This giant, vintage card/centerpiece sums up my excitement for the new year! I am marching into January with some big plans and goals. (Just picture a slightly older/chubbier guy with a goatee in the same pose.) I am grateful for the support I have had this year in my ever-expanding endeavors, and I hope to bring a little more glitter into a few more lives this year. Categories: Uncategorized | Tags: 1950's, Etsy, New Year | Permalink. I have posted some of my “antiquey” wreath and trees, the red/green aluminum tree, and the “frosty” traditional tree before here and on Instagram. 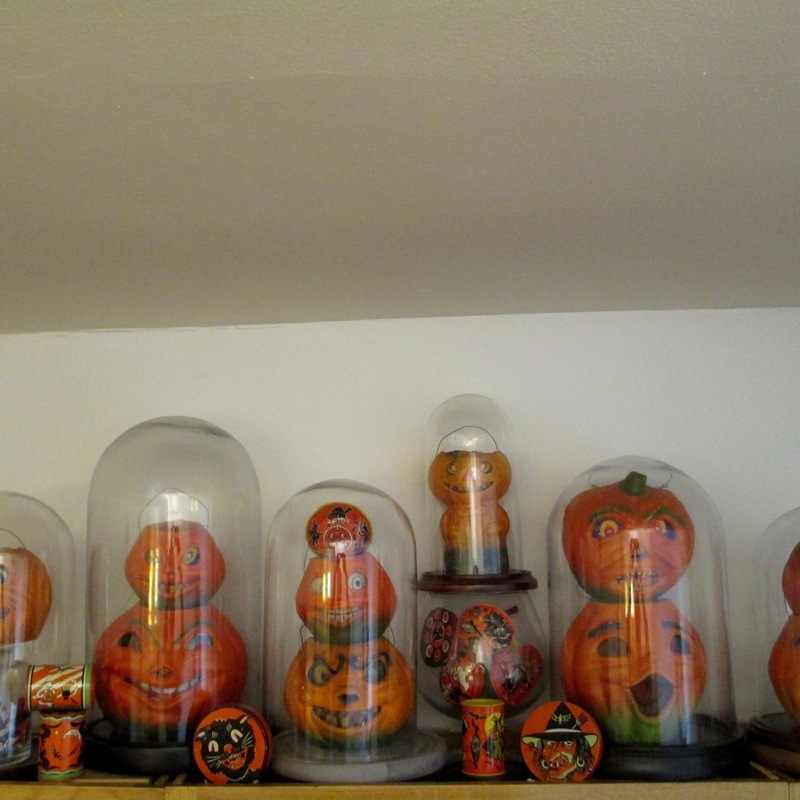 They all only had minor additions and changes this season, so I thought I would show some of the newer additions and re-workings to the the decorations this year…. 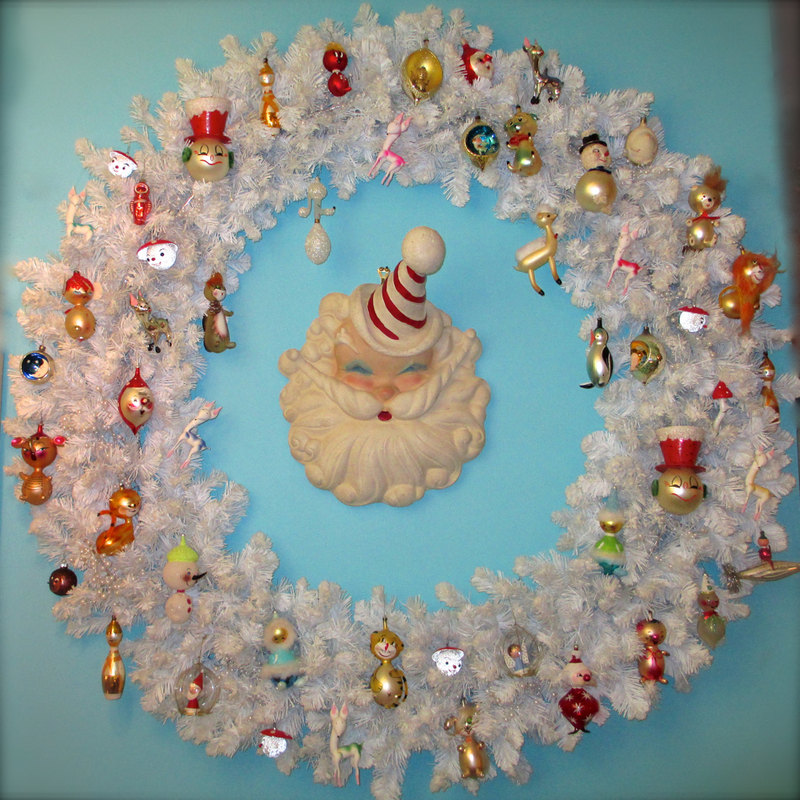 The “Wreath O’ Whimsy”….a giant wreath with vintage Italian and West German ornaments. 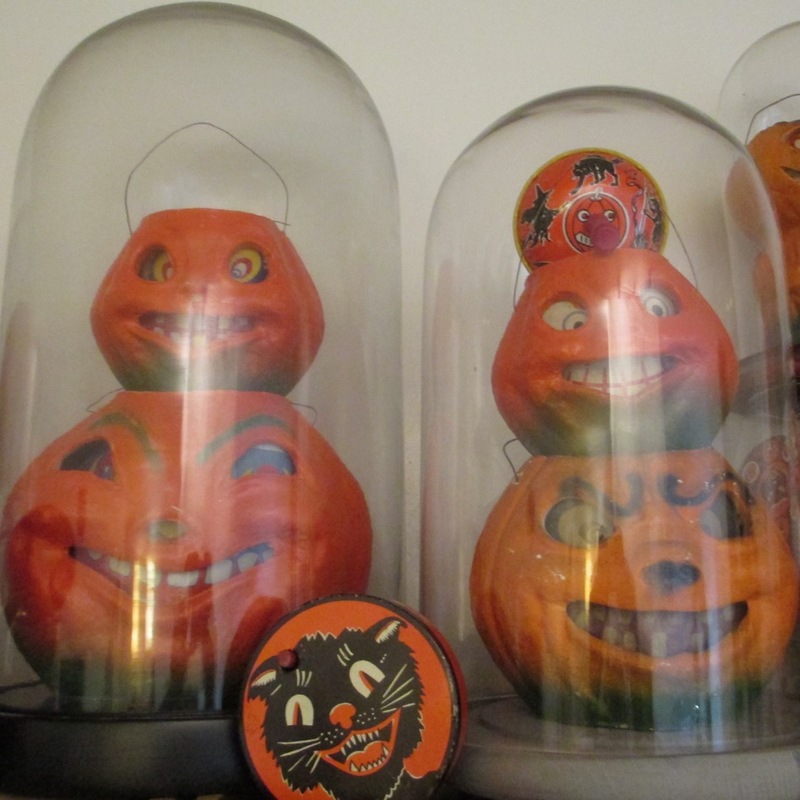 An unusual, plaster, 1950’s Santa Claus store display head watches over the menagerie. 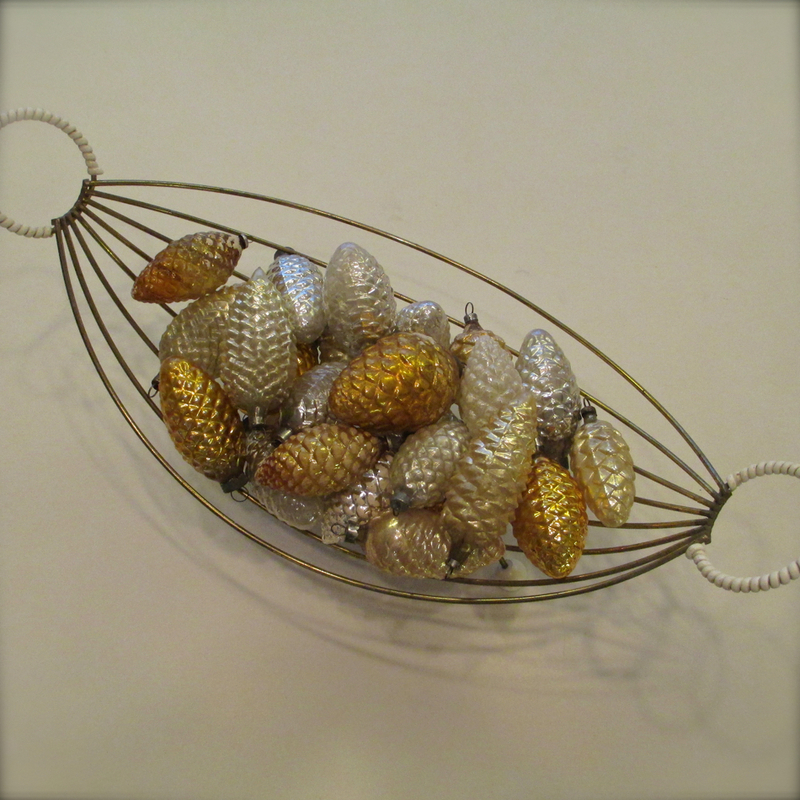 A 1950’s fruit bowl filled with old glass pinecone ornaments in silvers and golds. 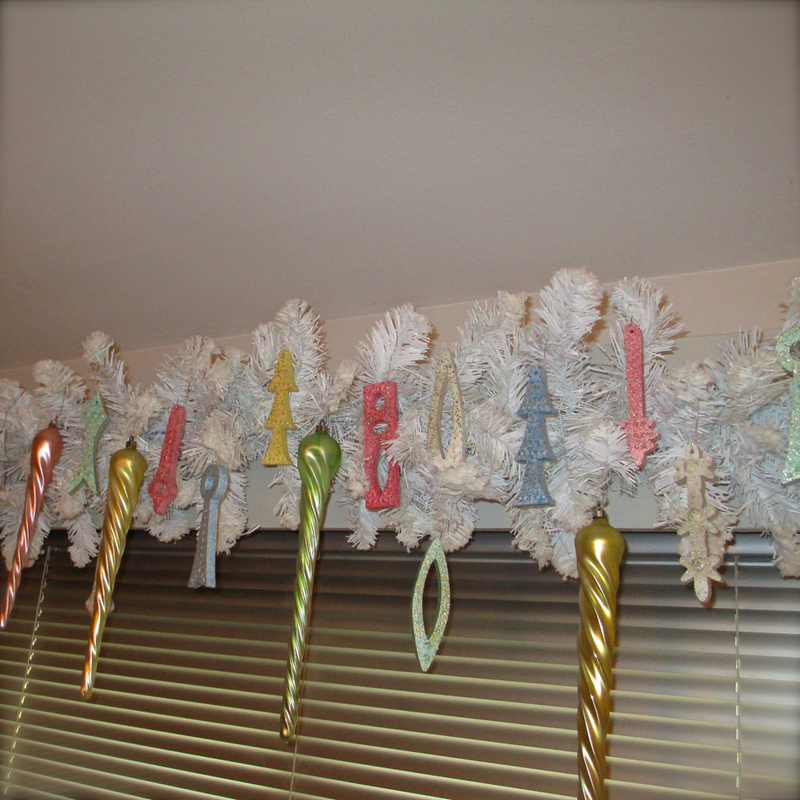 A new valance garland with West German glass icicles and rare 50’s moderne ornaments made of styrene! Large vintage foil ornaments lend a festive 50’s atmosphere to Living Room. 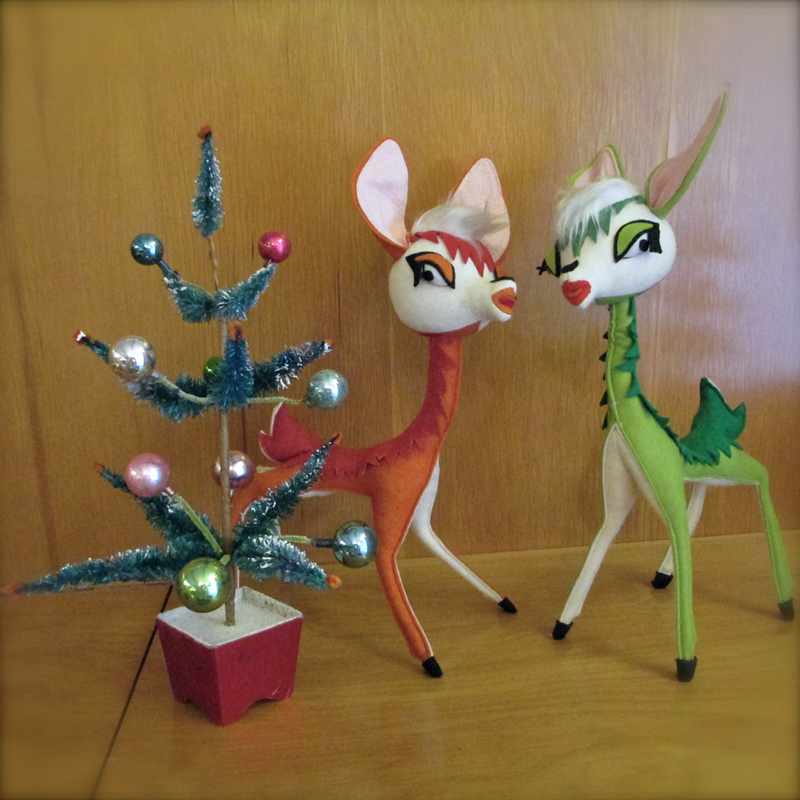 A new pair of large vintage Japanese deer in green were added to our red pair. The Foyer with multicolor polish teardrops, atomic foil boxes, 1950’s deer, and newly added vintage tinsel trees. 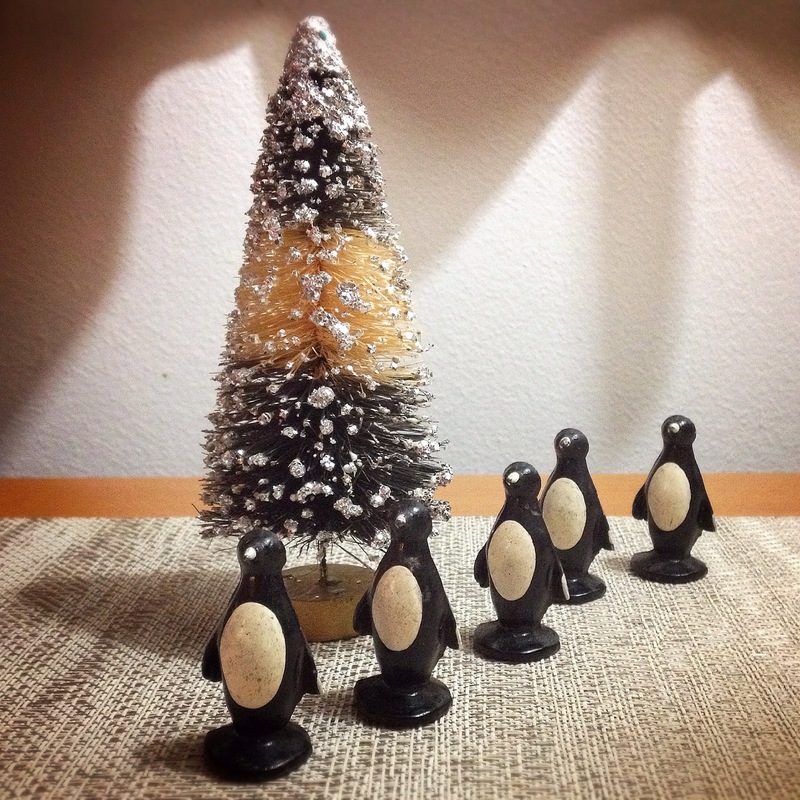 The old lead penguin toys found the perfect vintage bottle brush tree. 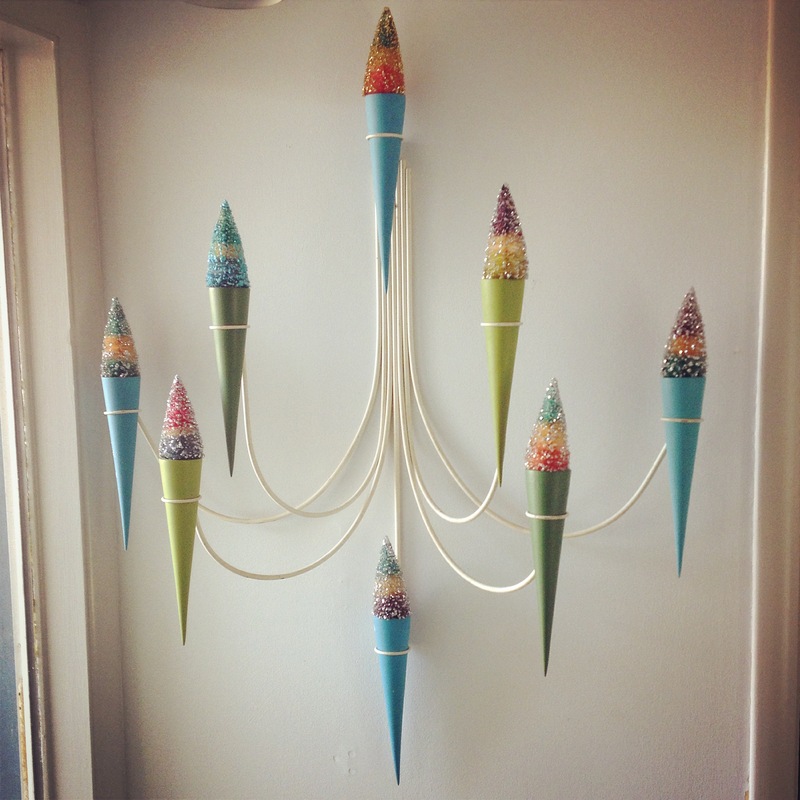 1950’s Peter Pepper Products candle sconce with striped vintage bottle brush trees. 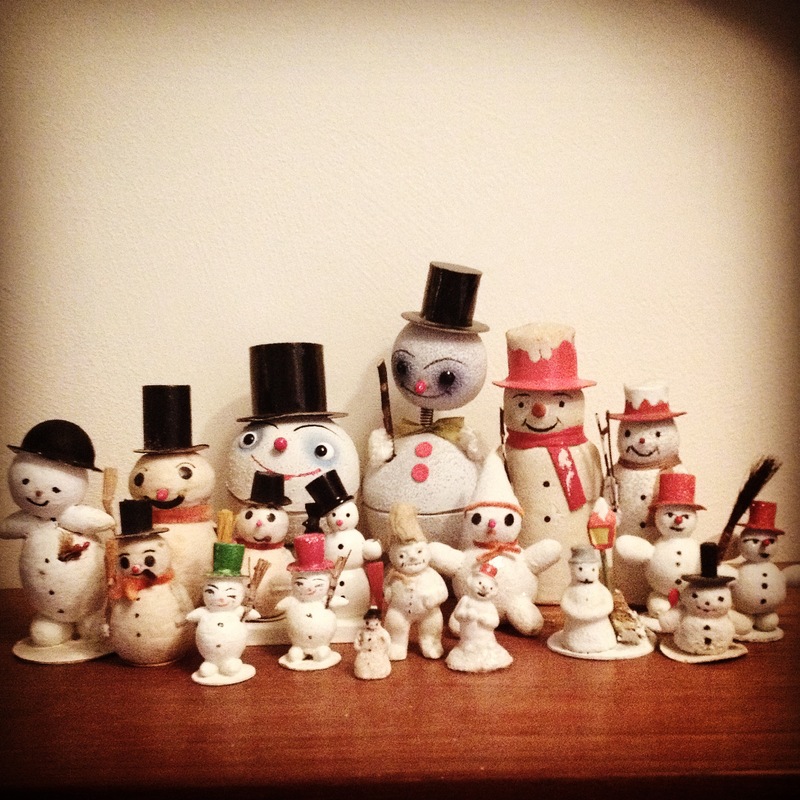 The snowman family had several new additions and a few moved on to new caretakers. 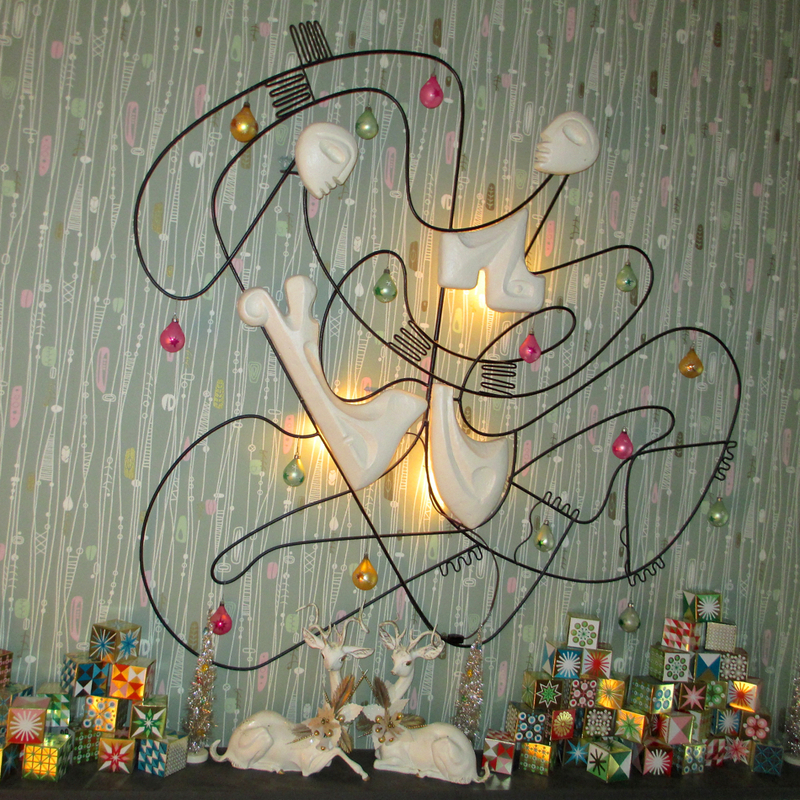 Our “Mod” fiberglass tree was reworked with late 60’s plastic diamonds and starbursts as well as vintage modern Resl Lenz glass and foil ornaments . 1950’s aluminum icicles add sparkle and some “spinners” float above the GE Lighted Ice bulbs. I think that covers most of the decorating updates!